Gary Sinise, recipient of the Association of the U.S. Army’s highest award for service to the nation, pledged that his work on behalf of service members, veterans, first responders and military families isn’t going to come to an end anytime soon. 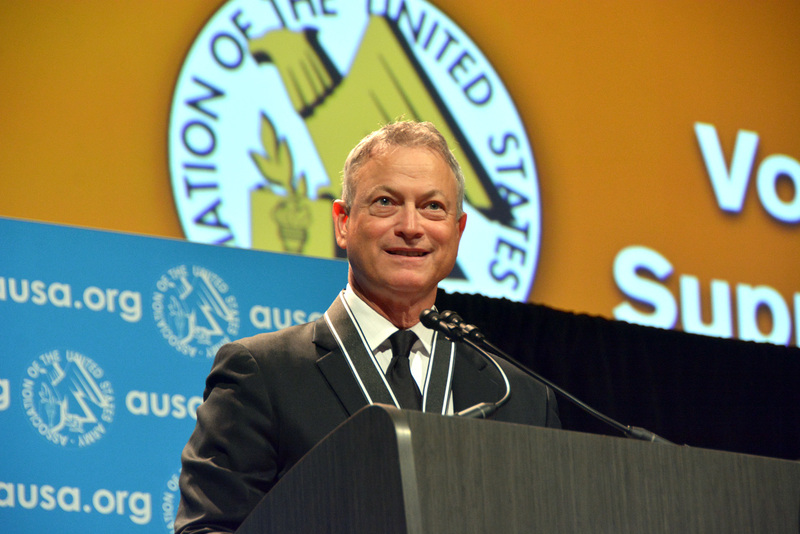 “For as long as I’m able, I stand with you,” Sinise said as he accepted the 2017 George Catlett Marshall Medal, AUSA’s award for distinguished, extraordinary and selfless service to the United States. “We can strive to do a little more each day so you will know we will always have your back,” he said. Adding, “I am so humbled to be here and deeply moved to receive this honor. … I know where my freedom comes from, and I will not forget our defenders,” he said. An actor, director, producer, musician and humanitarian, Sinise never served in the military but many members of his family served, dating back to World War I. One of his most famous acting roles was as a Vietnam veteran, Lt. Dan Taylor, in the movie Forrest Gump. Sinise said he was very close to many of his relatives who had served in the military, many of them in the Army, and that after the 2001 terrorist attacks he had decided to dedicate himself to making certain people who put themselves in harm’s way came home getting the respect and attention that Vietnam veterans never did. He has a nephew currently serving as an Army recruiter. The Marshall Dinner at the Walter E. Washington Convention Center in Washington, D.C., was the final event of the three-day AUSA Annual Meeting and Exposition, which was attended by about 30,000 people.